Being stationed at Fort Stewart, GA means that my husband and I get to enjoy Savannah’s St. Patrick’s Day festivities, which we have been told is one of the biggest celebrations in the Southeast. So, in our normal fashion, we plan on having a few people over to help us celebrate. Since the color of the day is green, I am planning on cooking up some healthy green treats to not only keep everyone energized throughout the day, but also sustain them for when they decide to indulge in some “healthy” beers. Some of the festivities start off on Sunday, so some of our guests may need a healthy dose of greens the morning of St. Patrick’s Day. To prep this ahead of time, I make and freeze the potato crust and chop the veggies to have them ready to go in the fridge. Then, all I have to do is assemble and bake this dish while everyone is getting ready for the parade. I know our crowd will be hungry after the parade so I plan on having these treats to satisfy their hunger. This is such an easy recipe that I don’t know why it took me so long to add it to my recipe arsenal. These are so yummy for a snack any time. Slice 1-2 medium zucchini into ¼-inch rounds. In a medium bowl, toss the zucchini with 2 tablespoons of olive oil until the zucchini is coated. Bake zucchini for 15 minutes and then flip. Sprinkle zucchini with about 1 cup of Parmesan cheese or until each slice has a little cheese. Bake for an additional 10 minutes or until golden brown. This is a dish that is easily made ahead of time. It is also good for a quick bite to eat for lunch or for a lighter dinner option. Instead of all the bread, I opted for lettuce wraps to add a little bit more green. You can also set up a chicken salad sandwich bar for people to fix their sandwich or wrap when they get hungry throughout the day. 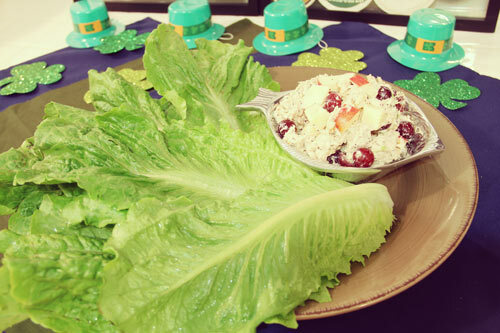 To keep the chicken salad cold, you can fill a large bowl with ice and a medium bowl with the chicken salad. Set the medium bowl on top of the large ice-filled bowl. Since I had many of these ingredients on hand, I decided to make this veggie dish as well. It looks so pretty and not to mention, easy as pie. This is another simple recipe that you can throw together in a few minutes. Coat the potatoes with olive oil. Toss with rosemary, thyme, salt, and pepper. Bake for 20-30 minutes or until you can easily poke the potatoes with a fork. 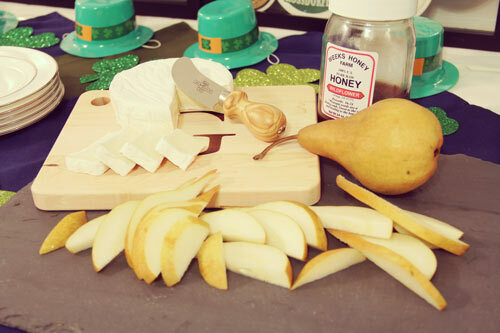 Slice up a few pears and a small wheel of Brie and you will have yourself a super easy and delicious dessert. A little jar of honey on the side is nice for people who don’t do cheese or who want a little extra sweetness. This usually goes pretty fast once I put it out, but if you’re worried about the pears browning you can lightly spray them with lemon juice. 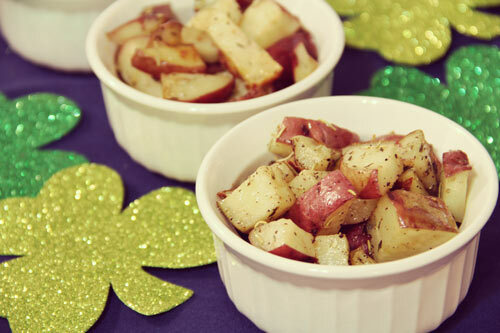 How are you and your family and friends celebrating St. Patrick’s Day this year? Do you have any special green recipes that you love? Share your favorites in the comments below.